Looking for a four season vacation home that is beautiful from the front and back? This sloped lot or hilltop model is sure to charm. The main level includes storage, a bedroom and a full bathroom, entirely open floor plan, abundant windows and corner fireplace. A beautiful screened deck allows outdoor pleasure without unwelcome “guests” and an adjoining staircase allows easy yard access. Upstairs, we find two large bedrooms, each with excellent storage, and a totally comfortable bathroom. An undeveloped walk-out basement allows for further living or recreation space. Call it your retirement or vacation getaway or better yet, call it home! Looking for other other panoramic view house plans or vacation or cottage designs? 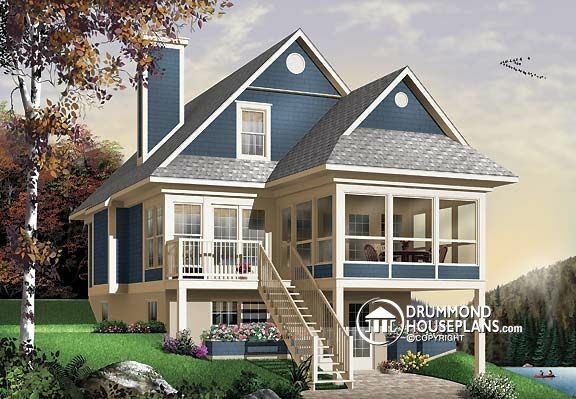 Check our Panoramic View Houseplan Collection, Vacation and Cottage Design Collection or Create a “New House Plans – Latest Trends” Alert to receive all of the latest designs direct to you by email!